I first saw John Edmed play when I was only 20 and he was a mere lad of about 17 at the Endevour, a scout hut in Melfort Road, Thornton Heath. He was pretty amazing even then. 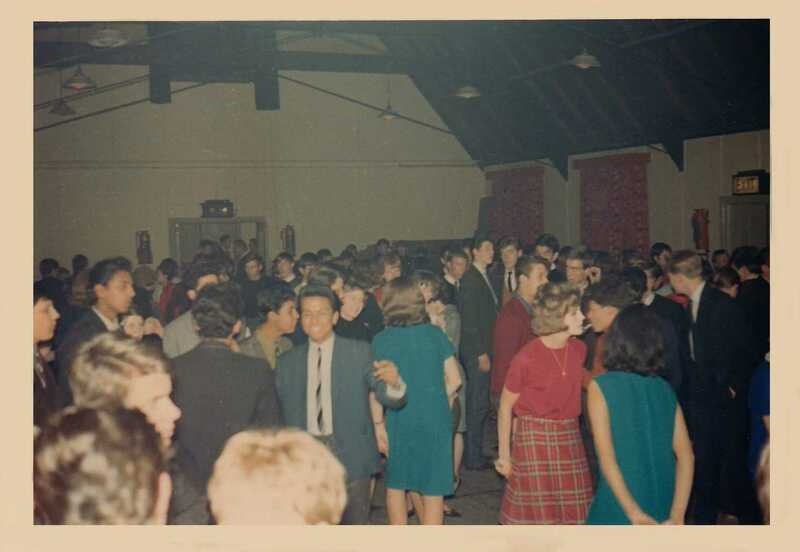 A year later in 1963, I was following the Partisans regularly at their once-monthly St Stephen’s Hall gig in Winterbourne Road, a few streets further westward from the scout hut and run by Norbury-based Architect Robin Redsull who lived at Pollards Hill. 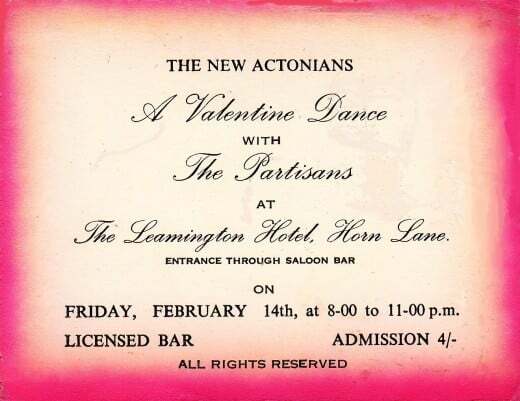 When I joined the band we all used to go to Robin’s place in Pollards Hill after the gigs, where we would recline on cushions in the sunken Roman bath-style section of the split-level flooring in the front lounge, while Robin and his wife Hazel served refreshments. 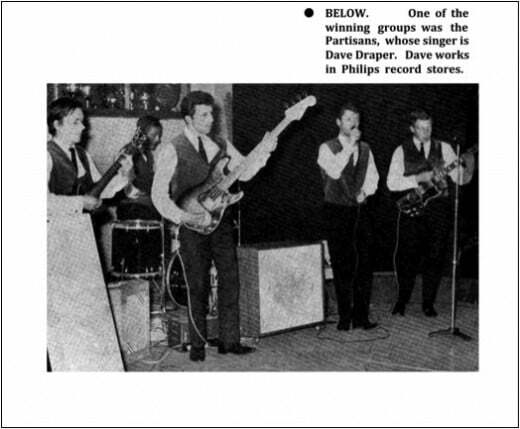 What impressed me most about the Partisans, despite being a vocalist, was their version of the Ventures instrumental, 2000 Pound Bee, in which they’d fiddle with the valves in their Watkins amps to produce the distinctive fuzzy sound, long before fuzzboxes and distortion-units came into general use. That number and the way the Partisans presented it, really grabbed me. And I much preferred the more subtle instrumental line-up they had in those days, with Pete Hanaway and John King, than the one they finally ended up with. Often, original is best. Actually the Partisans started out as Ricky Freeman and the Norsemen and they all came from Southend-on-Sea. 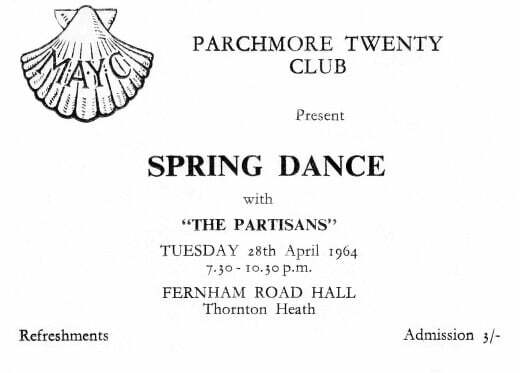 When they moved to London they played at the Partisan Coffee Bar in Soho and became known as the Partisans, eventually adopting the name for the band. During my several years gigging with the Partisans we played an assortment of venues in and around London and Croydon. 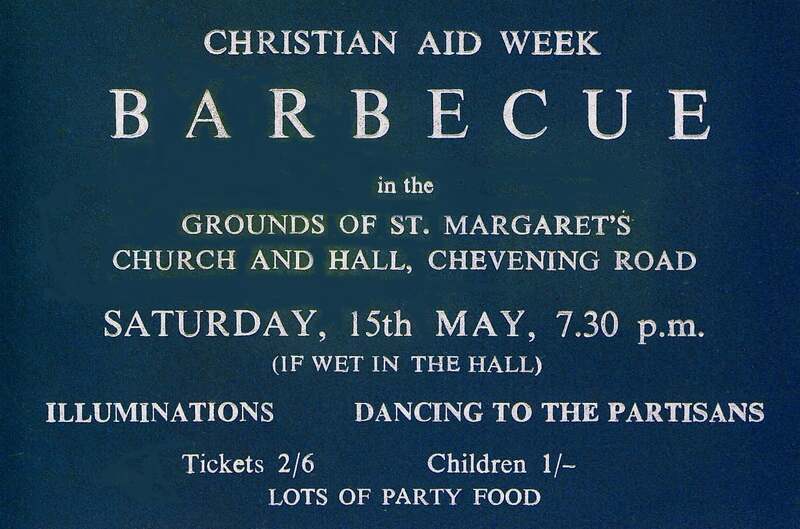 The two regular gigs they were playing when I joined were St Stephen’s and the Jazzhot in Fulham Road, Chelsea. 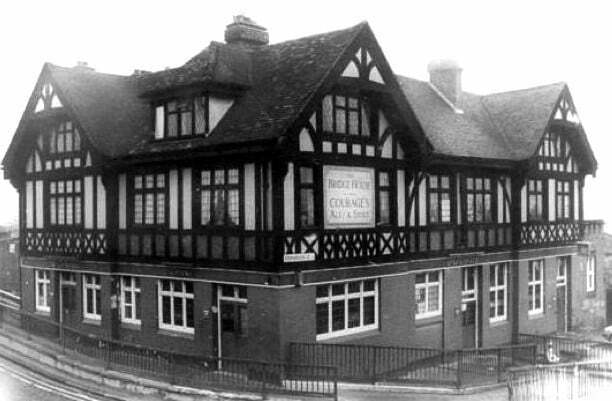 We also did a regular monthly rotational return at the Woodstock Hotel in Cheam for the Arthur Forrest Organization from which we gained other gigs such as the French Horn and Half Moon at Wandsworth, plus a whole string of other engagements. This included the Greyhound, Croydon; the Ruislip Lido, the Bed Sitter Club in Holland Park; the White Hart at Acton, the Century Hotel in Wembley; the Locarno Ballroon in Streatham and the Purley Social Club, to name just a few. Later on we did a regular weekend stint at the Bridge House in Canning Town for a while. We even won the Philip’s Beat Group contest and were awarded a free recording test with the record company, which the newspapers said would hopefully lead to a contract. This was on the basis that we had original songs of our own. Unfortunately none of us were songwriters at the time or had anyone proficient enough to supply them. 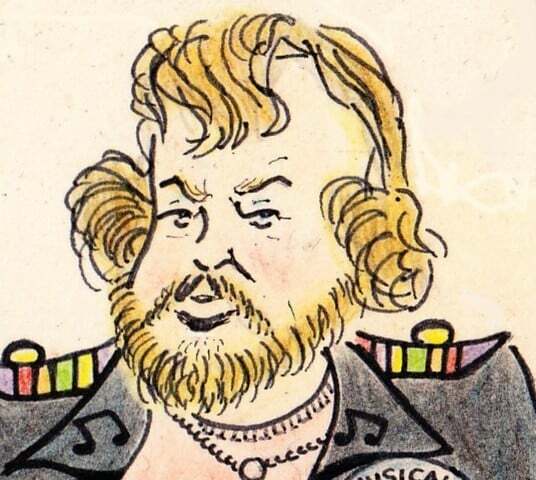 We answered an ad for a lyricist seeking composers and newly arrived keyboardist Bob Johnson worked like mad trying to put a tune around the dreary sample offered. But it just didn’t work, the lyrics were like a train-spotter’s guide. 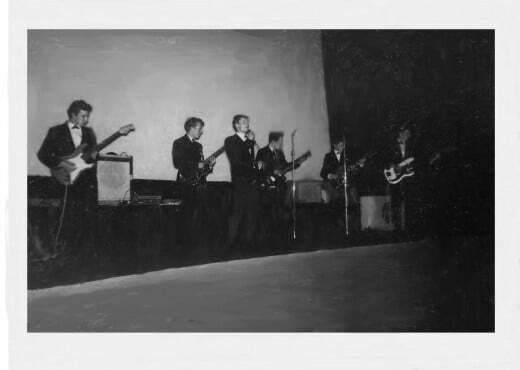 The line-up with the Partisans when I joined them at the start of 1963 was Pete Hanaway on Bass, John King on rhythm guitar, Gerry Lloyd on Drums and John Edmed on lead guitar. 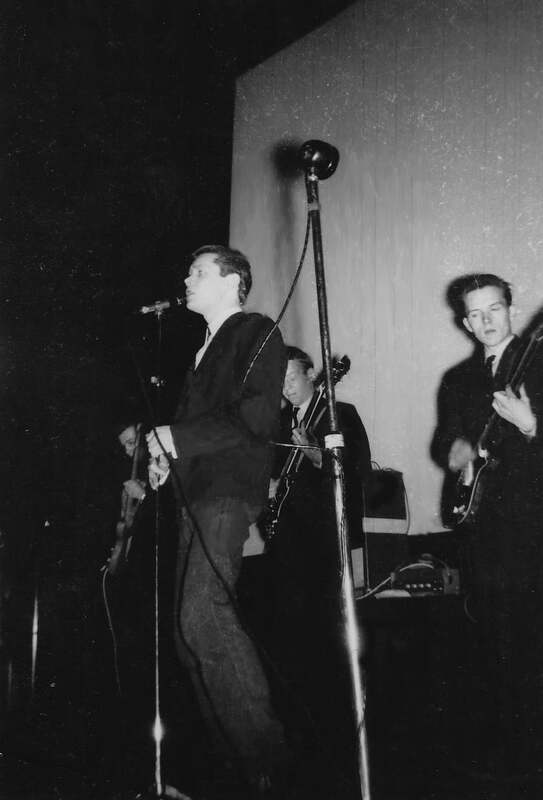 When I left in the autumn of 1965 to go to Germany with the Iceni, John King had already dropped out, Grahame Leach had replaced Pete Hanaway on bass and Bob Johnson had popped in on keyboards at the last minute. I began to feel out of place and threatened and started thinking seriously of leaving the band before I was ditched in favour of someone else, so I searched through the ads in the Melody Maker each week. Being a very competent keyboard player and an absolutely excellent singer, I thought Bob would’ve taken over as lead vocalist when I left. But he didn’t. Although he remained with them, they brought in a Jamaican vocalist instead, seeing as soul music was becoming the ‘in thing’. Besides, all my contemporaries were heading for Germany in the wake of the Beatles success, which had opened up the frontiers to a flood of British musicians and I had itchy feet. 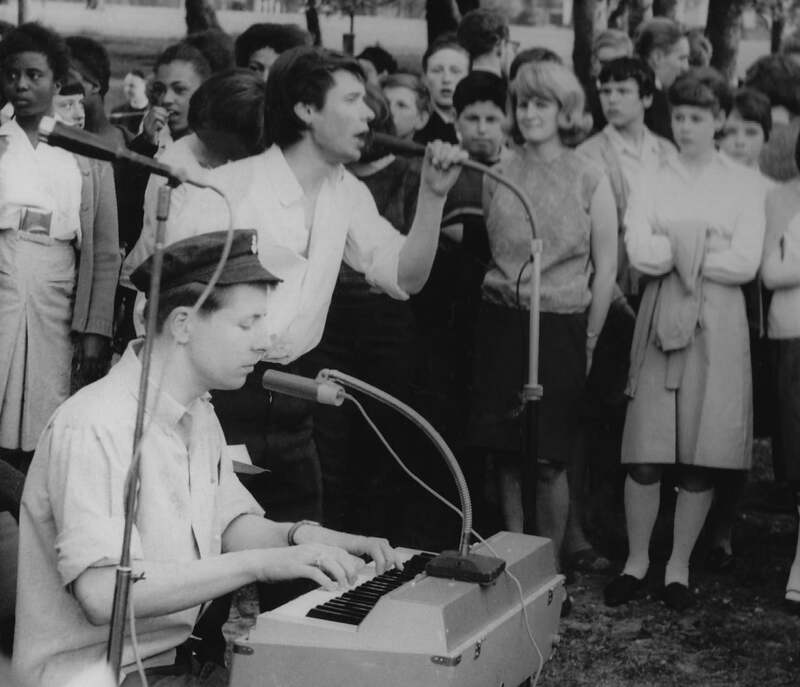 Ironically, The Partisans followed suit later, heading out to Germany with Bob Johnson and the Jamaican singer. Since the days of the Partisans JOHN EDMED [now sadly deceased] made quite a name for himself as a producer and country-style pedal-steel guitar player. He is listed in Chris Groom’s 1998 publication, ROCKIN’ AND AROUND CROYDON and mentions me as the Partisan’s only steady vocalist in his write-up on pages 60-61, [where you can read John Edmed’s own 2-page interviewed biographical account]. In the notes below, I have included an extract from my Biography entry, which gives a more lengthy and detailed account of The Partisans history. Originally the band was called Ricky Freeman and the Norseman and hailed from Southend-on-Sea. Pete Hanaway [spelled with one ‘n’, he informed me] had formed the band in Southend and they had moved to London, where he worked at Regent Polytechnic as a metallurgist. One by one, various members of the band left to be replaced by new, younger members from Thornton Heath. More than half-a-decade his senior, Pete Hanaway went over from lead guitar to bass when John Edmed joined the band as lead guitarist. Having learned Latin languages at the Trinity School of John Whitgift, John Edmed worked in the city as an interpreter for an insurance company called the Mercantile. With him followed his friends from Thornton Heath, John King on rhythm guitar, who worked for the Mundet Cork Company in Vicarage Road, Waddon and had his own office and secretary and finally, Gerry Lloyd, who worked as a shipping clerk somewhere around Liverpool Street who replaced Jim Smith on drums. Ricky Freeman stayed with the band as their singer. It was during this interim that the band changed their name. 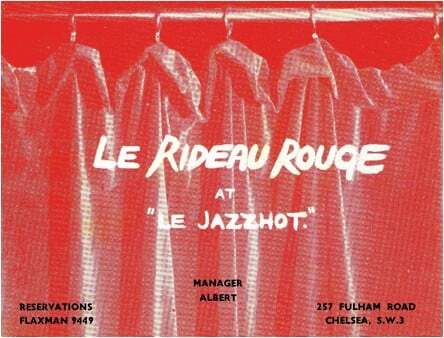 They had been playing at a coffee bar in Soho called the Partisan and “when everybody started calling us the Partisans,” John King told me, they eventually adopted the name and Ricky Freeman’s name disappeared from the title altogether. Ricky Freeman dropped out several times when the band started getting gigs in Thornton Heath to be replaced temporarily by various other singers, including Bob Johnson and Ron Diamond, whose real surname was Humphries and had attended the same school as me in Ingram Road, Thornton Heath. 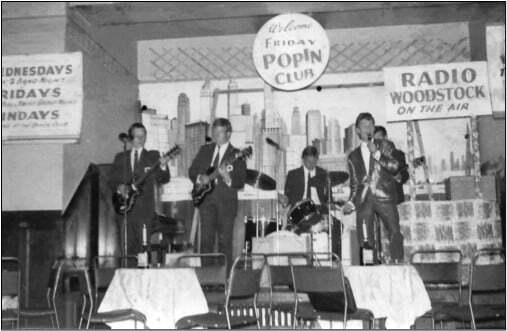 In 1963, When Ricky Freeman left the band altogether, I joined the Partisans as lead vocalist at John Edmed’s invitation. 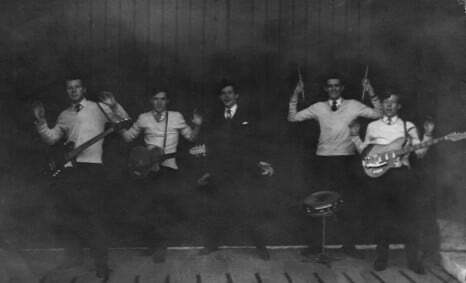 At the time I was still singing with the Castaways, having been with them little more than six months. 18 year old John Edmed lived in Warlingham Road, just around the corner from Foxley Road where Castaways guitarist Mick Gennoe lived, and I met him there while rehearsing for an upcoming Castaways gig. 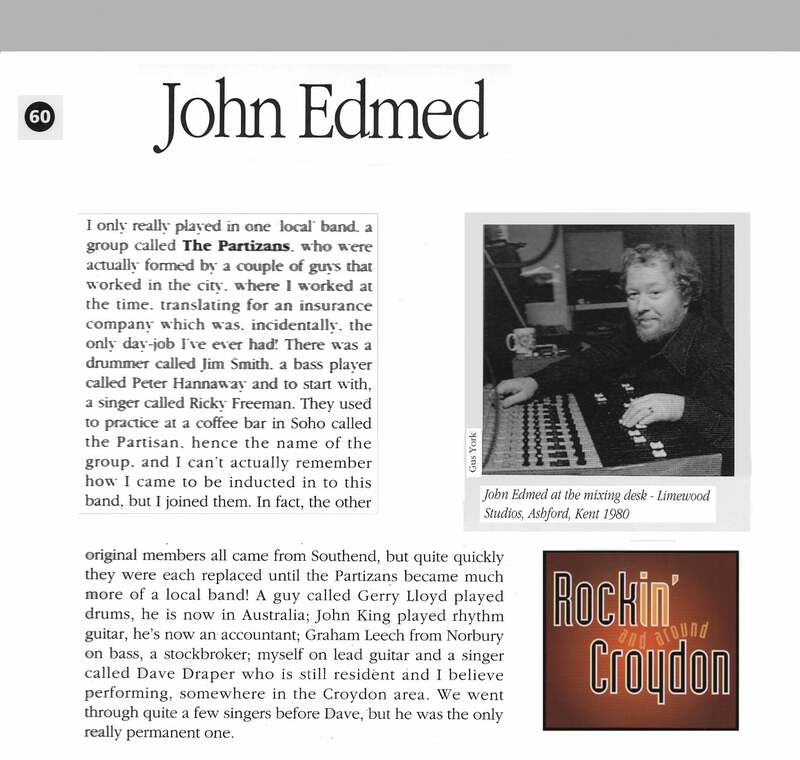 I’d seen John Edmed perform with the Partisans at St Stephen’s Hall many times, but this was the first time I met him personally. 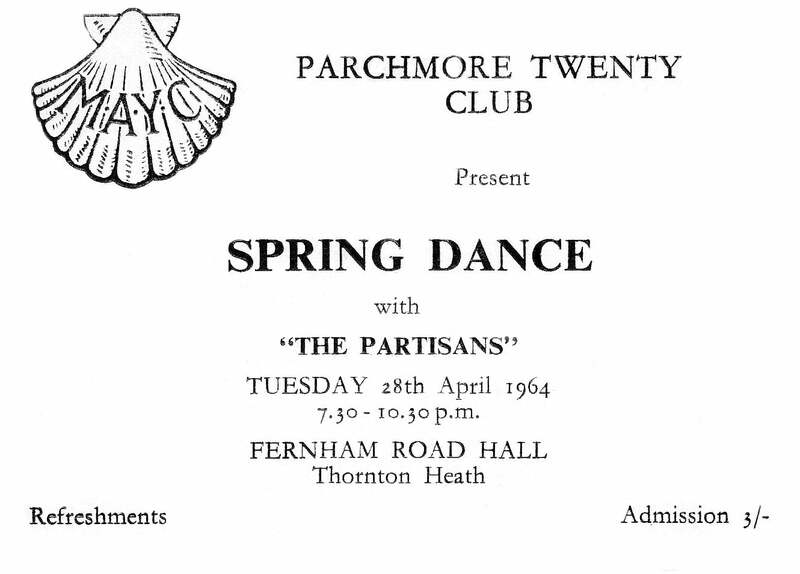 Although the Partisans were a very popular and musically competent band and because of this, I was actually very keen to join them, I was suddenly hesitant at leaving the Castaways in mid-swing after we’d developed a sense of camaraderie and formulated such a well presented stage act, especially since I didn’t really know any of the other members of the Partisans at the time. 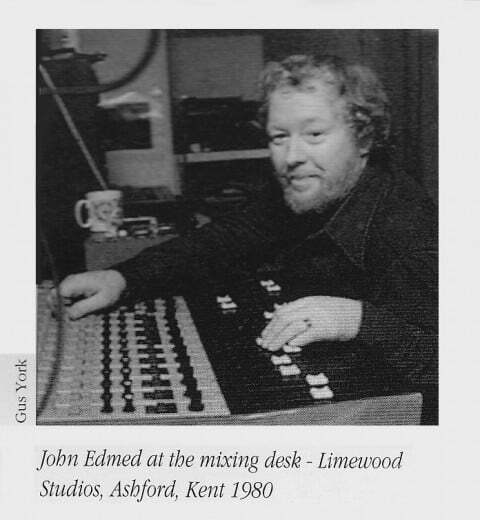 But John Edmed was very insistent, so I asked him why he wanted me particularly to join his band and he told me that it was because I had a particular way of putting my act across, and also that they had such a high turnover of singers, they needed somebody he considered reliable and dedicated – and so after some coaxing and not wanting to lose the opportunity and then regretting that I hadn’t taken the offer later; in 1963 at the age of 21, I became the Partisans lead vocalist. Looking back, I realize I made a decision rewarding me with a great wealth of experience that broadened my knowledge and outlook considerably. There were other gigs, such as private parties and social events. One of these was a rooftop party somewhere in London. This was well before the Beatles did it, plus it was at nighttime. 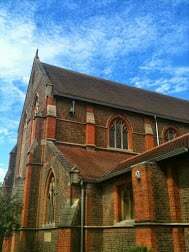 Our equipment was set up in the stage-lit shade between a parapet and a huge chimney stack looming up to one side above us. 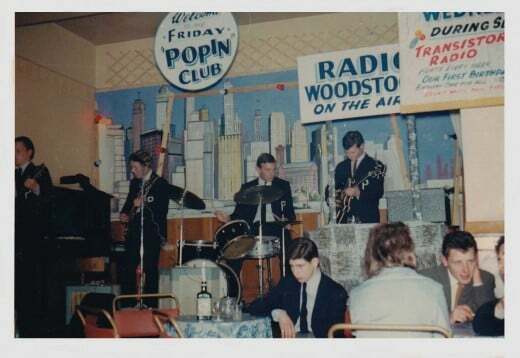 We won the Philip’s Beat Group contest in 1965 and were awarded a free recording test with the record company, which the newspapers said would hopefully lead to a contract and there was even a photo in the press of me and the other Partisans shaking hands with DJ Don Moss on the deal, although this was on the basis that we had original songs of our own. Unfortunately none of us were songwriters at the time or had anyone proficient enough to supply them. Shades of Catch 22. We answered an ad for a lyricist seeking composers and newly arrived keyboardist Bob Johnson worked like mad trying to put a tune around the dreary sample offered. But it just didn’t work, the lyrics were like a train-spotter’s guide. 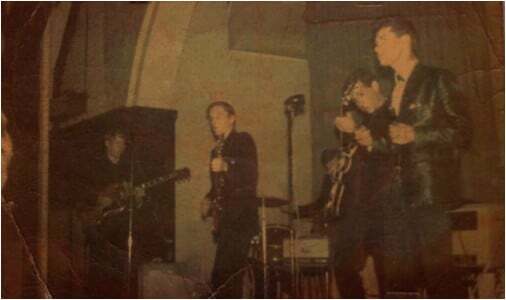 The line-up with the Partisans when I joined them at the start of 1963 was Pete Hanaway on Bass, John King on rhythm guitar, Gerry Lloyd on Drums and John Edmed on lead guitar. 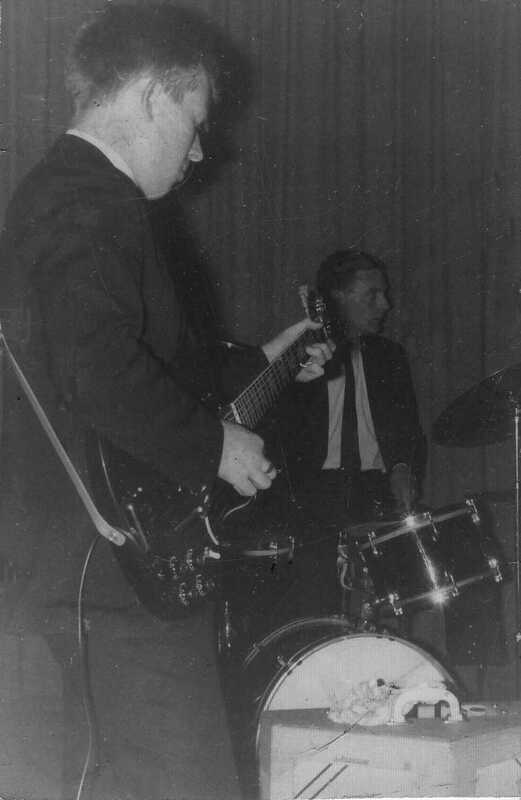 When I left in the autumn of 1965 to go to Germany with the Iceni, John King had already dropped out, Grahame Leach had replaced Pete Hanaway on bass and Bob Johnson had popped in on keyboards at the last minute. 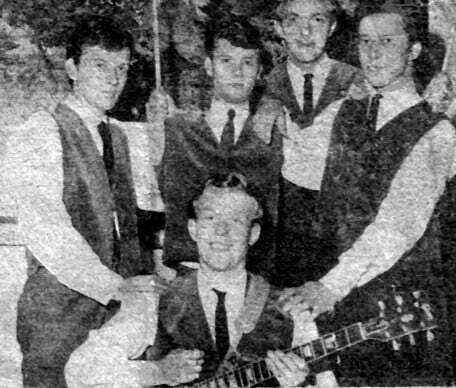 I began to feel out of place and threatened and started thinking seriously of leaving the band before I was ditched in favour of someone else, so I searched through the ads in the Melody Maker each week and found a position as lead vocalist via audition with the Iceni, an Essex based band who were heading out to Germany. Being a very competent keyboard player and an absolutely excellent singer, I thought Bob would’ve taken over as lead vocalist when I left. But he didn’t. Although Bob remained with them as keyboardist, they brought in a Jamaican vocalist to front the band and switched to soul material by artists such as Otis Redding and Wilson Pickett. 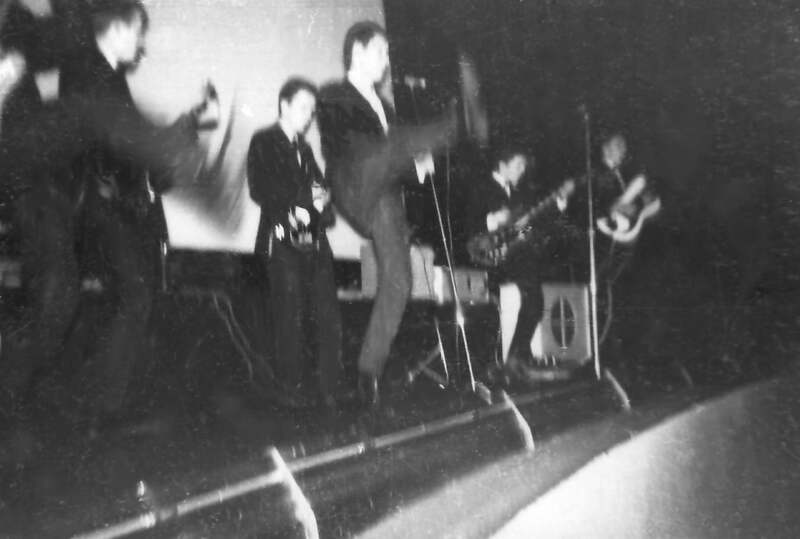 At that time, all my contemporaries were heading for Germany in the wake of the Beatles success, which had opened up the frontiers to a flood of British musicians and I had itchy feet.